WEBSITE DESIGN at WP Support Services, we create amazing websites. A website starts with an idea. Make your Dream Website Design a Reality. Our website design team and there do or die attitude are experts at converting your dreams in to your reality. WordPress allows us to create amazing websites that are multi functional, Google Compliant, have cross browser support and a fully responsive website design that works on everything from your computer to your phone and every size in between. This gives us certain advantages over the standard HTML Websites. The most important two points for any Website Design are Speed and Security. WordPress allows us to ensure your website excels at both of these points. Now before you say “WordPress“ but I thought that was for blogs. 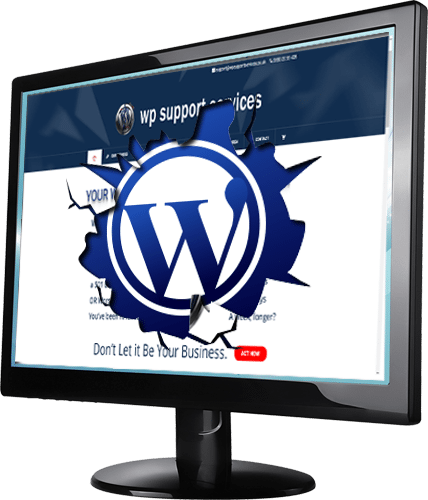 WP Support Services uses WordPress, this entire site including the account integration has been designed using WordPress as it’s back-end. WordPress is the most dominant content management system on the web today and 28.6% of all websites are built on WordPress. It has a diverse user base from personal bloggers to Fortune 500 companies and every type of businesses in between. WordPress’s flexibility makes the platform capable of meeting almost any business’s needs. A big company has complex needs. WordPress isn’t possessive or jealous about your website design, through its numerous APIs, it plays well and integrates with all of your data, content management systems, and can handle the whole or just part of your web presence. Fortune 500 companies have consumers spread across the world and in different markets, and often social channels are the way to reach them effectively. With a click WordPress can activate and publish to social channels so your clients and partners are always up-to-date, wherever they are. WordPress is a feature-rich solution that just works, right out of the box. A whole community is focused on the core software development so we don’t have to, which means we can focus on making your website design unique and being able to ensure you can launch your website quickly. Not sure what your going to need, Want Something Even More Unique. Talk to our website design team leader about your ideas.